Go Wild gift vouchers make the perfect gift. Go Wild vouchers directly from your armchair it's so easy to purchase, and print it off immediately for that perfect, unique and awesome gift. You can purchase a gift voucher for any of the experiences at Go Wild At The Warren. 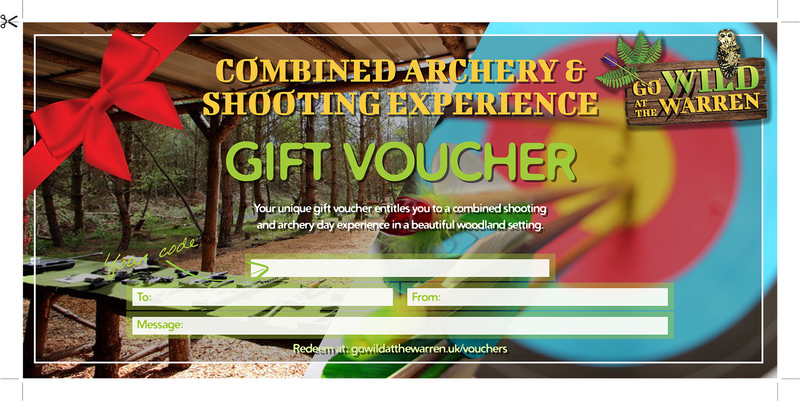 If you’re not quite sure if it’s archery or shooting experiences you prefer, we will be happy to accept these for other activities of the same value or as a part payment. Received a gift certificate from a friend or family member? You can redeem these on any activity of the same value or use the voucher to go towards an experience of greater value. Our gift vouchers make a great unique present! They are the perfect gift, and one you can be assured will keep the person that has everything very happy. Available 24 hours a days 365 day a year! Just purchase your voucher and print off immediately! Our vouchers are valid for 10 months, unlike many other companies only offering 6 to 8 months validity. Once you’ve purchased your voucher, please click on one of the buttons below to download a printable customisable voucher. Having clicked on your chosen button, please select ‘file’ ‘print’ from your browser menu to print off your voucher. You can return to this page at any time to print and customise your voucher.